Do you make cookies for Christmas as gifts to give friends, neighbors, family or just for home? Are you like me … make plans to bake rolled out cookies, decorate with great details … reality hits … not enough time to do everything … something’s gotta give? It happens to me EVERY SINGLE YEAR! I still bake … bars, drop cookies, just not all the pretty decorated cookies that I had planned! Bars and drop cookies are great, don’t get me wrong … just want that pretty decorated cookie festive look! 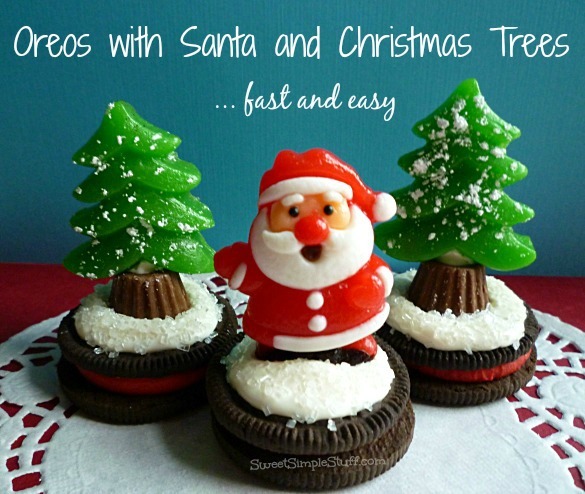 I have a solution … Santa and Christmas Tree Oreos … fast and easy … my favorite way of doing things! 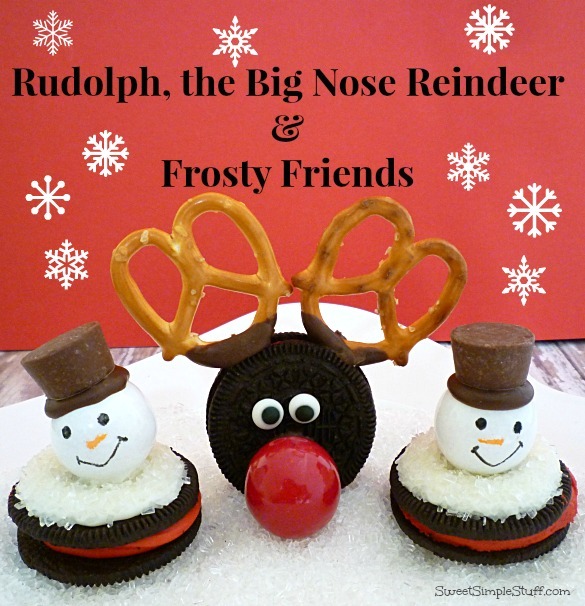 Just a few of these Oreos will add that festive touch … dress-up any cookie plate … colorful, whimsical and a little sparkly! It’s what I call instant decorating! The Santas and trees are Holiday Gummies that I found at Target in the $1 bin … yeah! If you can’t find these exact candies … many stores have similar ones. Any ready-made candy or icing decoration will work just fine. 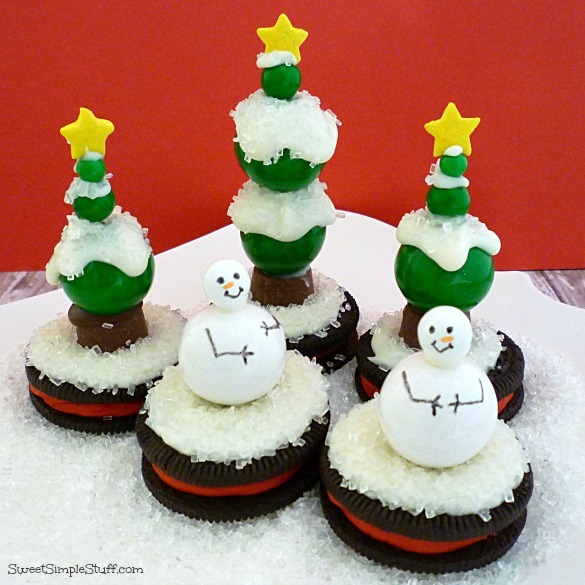 Ready-made decorations attached to ready-made cookies … fast and easy … that’s a win in my book! 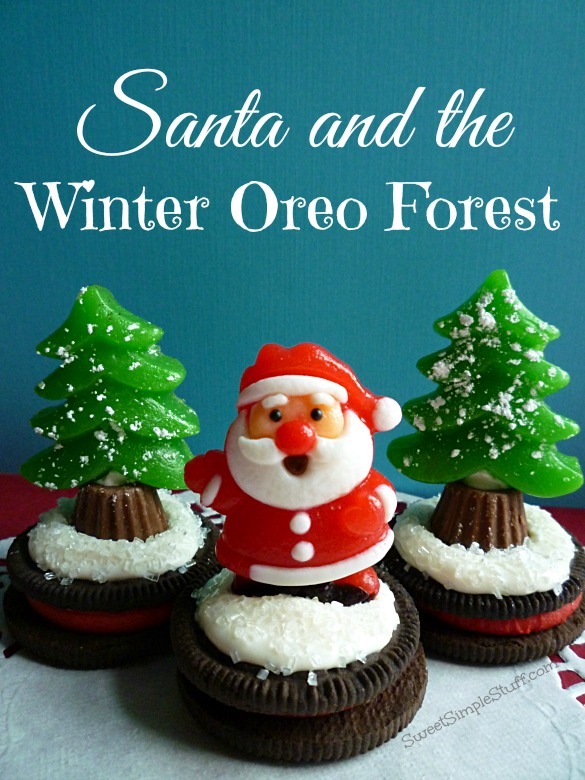 Spoon a little melted candy on one side of a Oreo and sprinkle with some sugar crystals. 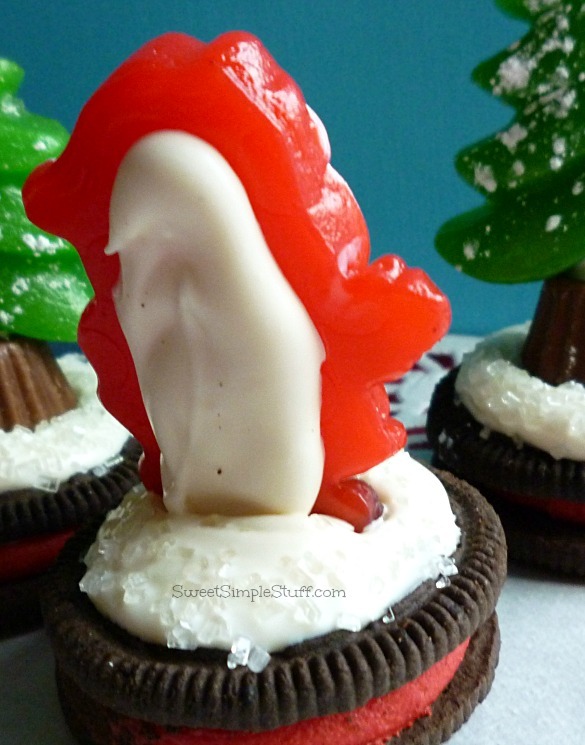 For the tree … place a Reese’s Mini upside-down and let white candy harden up, then use a little melted candy to attach tree, let harden up. Sprinkle with powdered sugar. For Santa … stand him in the melted candy and hold until attached. 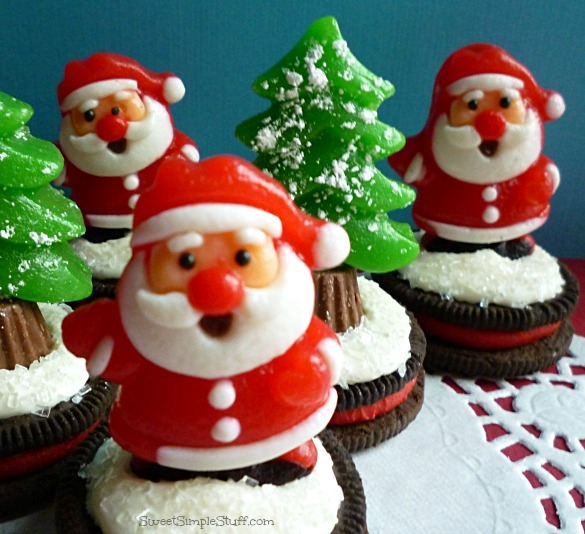 Helpful hint: to help Santa stand faster … place him in melted candy, lift him a little and place back. You are done! Easy peasy … right? These little guys could be individually bagged up, added to any cookie plate, on a cupcake, a cake or ??? I love how you created the snowy scenes on the cookies. 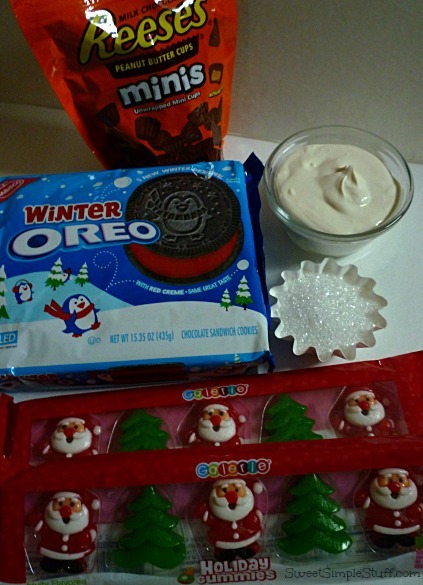 Those gummies are great and they are the perfect topper for a cookie. Thank you Beth 😉 I loved those gummies when I first spied them! Absolutely superb! Off to Target now!! Thank you Dinaz 🙂 May you have good shopping luck! So adorable! Perfect for a kids table!